The after party was produced for Aria as collaboration between Denis Bourke Productions & Republic Events, both Melbourne based companies. 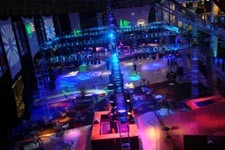 All aspects of the event including the layout, lighting and rigging were designed by Denis Bourke. The venue was the Grand Foyer of the Sydney Superdome. In order to transform the Grand Foyer for the party they had to black out the 155m of venue windows to the height of 11m. The ceiling of the Grand Foyer will not support rigging of any consequence so they had to design and build free standing truss structures to support all of the production elements. 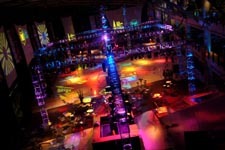 Lighting and rigging equipment was provided by Bytecraft. 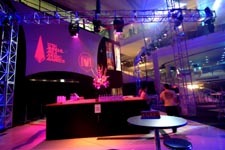 In addition to the main party space, there were three additional areas designated chill out zones. These were the Club Lounge (overlooking the dance floor), the Boulevard Café and Boulevard Terrace. The intention of the two Boulevard areas was to re-create a Manzil / Springfields / Bennys type atmosphere (for those old enough to remember) with subdued lighting and lounge furniture. Given that these two rooms were still operational at 5:00 am with all of the usual suspects plus many more contemporary ones in full flight, it would seem that they succeeded. 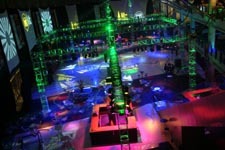 In all there were 116 odd programmable fixtures and over 407m of CLS trussing that were used on the job. Side Windows Drape Structure - 28 Alloy tri truss 300mm c/c - 3m Sections, 3 Alloy tri truss 300mm c/c - 2.25m Sections, 7 Alloy tri truss 300mm c/c - 1.5m Sections, 1 Alloy tri truss 300mm c/c - .75m Section, 6 Alloy tri truss 300mm c/c - Six way cube joiners, 7 Alloy tri truss 300mm c/c - Circular base plates.